Saraswati Puja and the Talent Galaxy 2014 were successfully held on 9th February with a packed hall and enthusiastic participants in spite of all the hurdles caused by the snow storm and record breaking snowfall on the previous day. OCJ and the organizers of the Talent Galaxy 2014 are very much grateful for such overwhelming responses from the enthusiastic participants, parents, visitors and invited guests. The Talent Galaxy was inaugurated by the Deputy Chief of Indian Mission Mr. Sanjay Panda in the presence of several dignitaries. 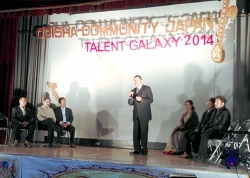 The performances presented by the Indian and Japanese kids were outstanding. The competitions were very tough and it was very difficult to choose the winners and runners among such high level of performances. We understand some the difficulties the parents, visitors, participants and the dignitaries might have faced. The organization of the event following the heavy snow on the previous day was very difficult from the logistic and management points of views with only a handful of volunteers. Nevertheless, it was a first successful attempt to bring out the extraordinary talents among the expatriate Indian kids in and around Kanto region. Talent Galaxy organizers are very much thankful for the great participations of the kids and parents. The event will grow from here and will include more Indian and Japanese kids from other regions of Japan. We are indebted for your kind supports for the finale of the Talent Galaxy in spite of all the hurdles created by the extreme weather conditions. We had a very difficult time to arrange the event but we tried our best with the limited resources that we could gather during the record snowstorm. But we understand that some parts of the arrangement may not be up to your satisfactions and we would like to hear your feedbacks to make the arrangement of future Talent Galaxy events as perfect as possible. Please rate each of the following items and provide your comments below.